1 Medical University of Gdańsk, Department of Physical Therapy, Gdańsk, Poland. 2 University of Finance and Management, Department of Psychology, Warsaw, Poland. 3 Medical University of Gdańsk, Clinic of Adult Psychiatry, Gdańsk, Poland. 4 Medical University of Gdańsk, Department of Quality of Life Research, Gdańsk, Poland. 5 Pomeranian University in Słupsk, Department of Public Health, Słupsk, Poland. 6 Medical University of Gdańsk, Post-graduate studies, Clinical Psychooncology, Gdańsk, Poland. Study conducted at: Department of Quality of Life Research – Medical University of Gdańsk. Ul. Tuwima 15 – 80-210 – Gdańsk, Poland. Background: Breast cancer confronts women with a threat to life and is classified among the most traumatic life experiences. The disease is often accompanied by strong negative emotions, often in the form of anxiety and depressive symptoms. Studies also point to the presence of chronic pain breast-cancer survivors. Objective: To determine the relationships of: (1) anxiety and depressive symptoms with the experienced severity and interference of pain in post-mastectomy women; (2) anxiety and depressive symptoms with beliefs about pain. Method: The studied group consisted of 53 women after radical mastectomy, experiencing chronic pain, despite positive results of cancer treatment. IPQ-R (Illness Perception Questionnaire – Revised) and HADS (The Hospital Anxiety and Depression Scale) were applied. Results: Correlation and regression analyses confirmed relationships of anxiety and depressive symptoms with pain in the group of post-mastectomy women. Cluster analysis separated three groups of patients, differing in the severity of depressive symptoms and anxiety. For each group, a different pattern of beliefs about pain was characteristic. Discussion: The study has shown that psychological determinants play a significant role in the perception of pain severity and interference, which are related to anxiety, depressive symptoms and a system of beliefs about pain duration. Keywords: Chronic pain, anxiety, mastectomy, depression, illness perception. Diagnosis and treatment of breast cancer are traumatic experiences involving agitation, insomnia, loss of appetite, anxiety about death, worry, and regret. All the symptoms gradually subside, but in about 20%-40% of women anxiety and depression persist for many years after treatment1-3. Remote chronic pain affects 20%-60% women treated in the early stage of breast cancer4,5. According to International Association for the Study of Pain, pain as a psychosomatic sensation is an unpleasant sensory and emotional experience associated with actual or potential tissue damage, or described in terms of such damage. Chronic pain is defined as serving no purposes of adaptation, devoid of biological value, persisting beyond the expected period of healing, not responding to typical treatment, and lasting more than 6 months. By distress and suffering, chronic pain contributes interactively towards deteriorating patient’s quality of life in biological, psychological, social and spiritual dimensions. Recurrence is a specific feature of chronic pain, and anxiety and depression play an important role in its perception6-8. Intrusive thinking and catastrophizing related to breast cancer are among factors supporting the presence of pain. Intrusive thoughts are unwanted and recurrent reflections of stressful experiences. If those thoughts linger after the stressor ends, they may be a risk factor for poor adjustment. This kind of cognition and pain recurrence have been associated with anxiety about cancer metastases. Intrusive thinking may be related to somatic symptoms by sleep disorders, chronic fatigue and increased susceptibility to physical sensations; its presence is indicative of an adaptation failure9-11. Intrusiveness of a disease is understood as a variable mediating in relationships between characteristics and treatment of the disease and patient’s subjectively perceived well-being. It results in limitations or abandonment of patient’s previous lifestyle, physical activity and interests. Relationships between intrusiveness and wellbeing are related not only to the variables associated with disease (e.g. pain, disability) and treatment (medication and treatment side effects), but to the psychosocial context as well. Intrusiveness is considered to be a fundamental determinant in the quality of life in patients with chronic conditions12,13. As the data in literature show, symptoms of pain, depression and anxiety (referred to as post-mastectomy pain syndrome, PMPS) are recorded in a relatively large group of women, many years after successful breast-cancer treatment14. Research on factors responsible for the persistence of anxiety and depressive symptoms and chronic pain has not yet arrived at conclusions about their psychosomatic determinants. Research within this study was aimed at understanding how anxiety and depressive symptoms are related to pain and was based on the concept of cognitive representation of pain perception by Leventhal et al. (Common Sense Model of Illness Perceptions)15. The assumption of Leventhal’s model is that the effectiveness of treatment in chronic disease is strongly dependent on cognitive and emotional processes associated with perception of health risk (or disease) symptoms. 1. 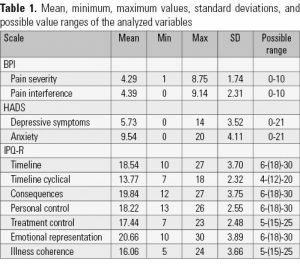 Is there a relationship between anxiety level and depressive symptoms severity and: (a) severity of pain, (b) pain interference, experienced by post-mastectomy women? 2. Is there a relationship between anxiety and depressive symptoms severity and a quality of beliefs about pain? The study was conducted in a rehabilitation clinic in 2014 (the clinic is visited by about 120 patients monthly). From all of the patients 53 women were recruited for the study. The inclusion criteria were: radical mastectomy, pain-related ailments lasting for more than 3 months, physiotherapeutic treatment. All subjects were under oncological care and patients with active cancer were excluded, based upon clinical, laboratory and radiological diagnosis. Participants age was between 38-80 years (mean 62.73 ± 9.31). Fifteen subjects (28.3%) had higher education, 34 (64.2%) – secondary education, 2 (3.8%) – primary, and 2 failed to answer. Twelve women were economically active (22.6%), 34 were not (64.2%), and 7 subjects (13.2%) failed to answer. The total sample size varies in the range of N = 51 to N = 53 due to the missing responses in certain positions of research tools. All of the subjects had undergone a radical mastectomy as a result of breast cancer. The mean time from mastectomy was 8.24 ± 4.8 with the minimum and maximum period of 3 and 24 years respectively. Participation in the research was anonymous and voluntary. Informed consents of the association president and all subjects were obtained. Illness Perception Questionnaire-Revised (IPQ-R), Hospital Anxiety and Depression Scale (HADS) and Brief Pain Inventory (BPI) were used for the assessment of pain causes and pain perception. Authors of the Hospital Anxiety and Depression Scale (HADS)18 aimed to create a reliable tool for measuring anxiety (statements of tension, nervousness, dread) and depressive symptoms (statements of loss of joy, lowered mood, sadness, loss of interests) in patients population. The scale can also serve as a screening test for early diagnosis of psychological disorders in the group of patients with somatic illnesses19. The Brief Pain Inventory tool (BPI) allows for measuring pain severity (sensory dimension) and pain interference (dimension showing the degree to which pain affects patient’s life)20. The Inventory also comprises items to identify: the kind of pain, subjectively perceived causes of pain, and actions to relieve pain. BPI is a tool with proven validity and reliability, applied in many countries21. To evaluate the results of the study, correlation, regression and cluster analyses were conducted. As an assumption that tested variables were drawn from a normally distributed population was impossible, Spearman’s rank correlation coefficient (Spearman’s rho) was applied to the correlation analysis. All the calculations were performed with Statistica software, version 10 (StatSoft Inc., 1984-2011). Table 1 shows the mean, minimum, maximum values and standard deviations (SD) for variables of the BPI, HADS and IPQ-R scales. Additionally, the possible value ranges of the variables are presented. As indicators of the IPQ-R are dimensions, the midpoints corresponding to It’s hard to say answer in all positions were also marked. Moderate pain severity and interference was characteristic of all subjects. The results for BPI revealed mean pain severity at 4.29 ± 1.74 in a ten-point scale. Mean pain interference ranged between 4.39 ± 2.31. For the HADS, results of < 8, 8-10, and > 10 are considered low, medium or high respectively19. The depressive symptoms were of moderate severity, with the mean value of the variable at 5.72 ± 3.52. The highest obtained score was 14, and 38 subjects (71.7%) had low scores. Anxiety results were relatively high, with the mean value of 9.53 ± 4.10. For this variable, 35 people (66.1%) reached medium or high scores. In the cognitive representation of disease (IPQ-R) the mean values of the dimensions were: 18.54 ± 3.70 for timeline; 13.77 ± 2.32 for timeline cyclical; 19.84 ± 3.75 for consequences; 18.22 ± 2 55 for personal control; 17.44 ± 2.48 for treatment control; 20.66 ± 3.89 for emotional representation; and 6.06 ± 3.66 for illness coherence. Although all of the mean values are higher than the center points of dimensions, the difference in any case does not exceed one standard deviation. Results of the analysis of correlations between the psychological variables and the indicators of pain severity and pain interference are presented in Table 2. Pain severity was significantly negatively correlated with treatment control (rho = –0.29, p < 0.05). Pain interference was significantly correlated with depressive symptoms (rho = 0.39; p < 0.01), anxiety symptoms (rho = 0.33; p < 0.05), and with the emotional representations dimension (rho = 0.32; p < 0.05). 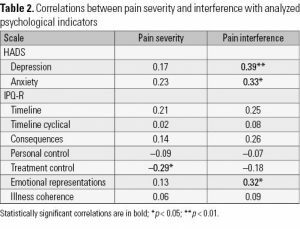 Other variables were not significantly correlated with the indicators of pain severity and interference. In order to determine the impact of the measured psychological variables on pain intensity and interference, regression analysis was conducted. A model assuming the impact of aggregated indicators of anxiety and depressive symptoms on the severity of pain proved to fit the data well (F (1.49) = 4.60; p < 0.05) and allowed to explain 9% of the variance (R2 = 0.09). The analysis confirmed the existence of positive relationships between the aggregated indicators of anxiety and depressive symptoms and pain severity (β = 0.29; t(49) = 2.14,p < 0.05). Pain interference was also assessed in the course of regression analysis. A model assuming an impact of the aggregated indicators of anxiety and depressive symptoms on this variable proved to fit the data well [F(1.49) = 6.64; p < 0.05] and allowed to explain 10% of the variance (R2 = 0.10). The analysis confirmed a correlation between the aggregated indicator of anxiety and depressive symptoms and pain interference (β = 0.34; t(49) = 2.58; p < 0.05). To answer the second question formulated in the study, k-means clustering was performed on the basis of anxiety and depressive symptoms, with the assumption of 3 clusters. Table 3 presents the mean values of depressiveness and anxiety in the separated clusters. Cluster #1 comprised 32 subjects and was characterized by low levels of both depressive symptoms (mean 3.68 ± 2.00) and anxiety (mean 7.09 ± 2.38). Cluster #2 comprised 10 subjects with low levels of depressive symptoms (mean 3.68 ± 2.00) and high levels of anxiety (mean 7.09 ± 2.38). In Cluster #3, 9 subjects had outcomes close to high in the range of depressive symptoms (mean 10.77 ± 2.33) and close to high in the range of anxiety symptoms (mean 11.77 ± 2.68). 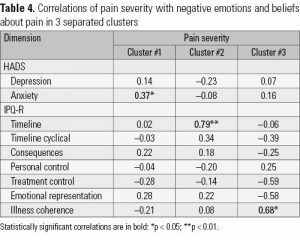 Table 4 presents pain severity correlation coefficients for negative emotions and beliefs about pain in the three separated clusters. 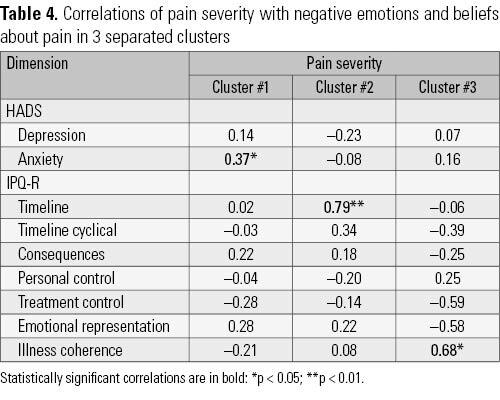 Pain severity positively correlated with symptoms of anxiety in subjects from Cluster #1 (rho = 0.37; p < 0.05), with the timeline dimension in subjects from Cluster #2 (rho = 0.79, p < 0.01) and with the illness coherence dimension in subjects from Cluster #3 (rho = 0.68; p < 0.05). Tables 3 and 4 show that in women with low anxiety and depressive symptoms, assessing pain as more severe was associated with an increase in the experienced anxiety level. Beliefs that pain was going to persist remained closely connected with assessing anxiety as severe. Women with high levels of anxiety and depressive symptoms assessed pain as more severe when they were certain of its relation to the disease. Other correlations proved to be statistically insignificant. 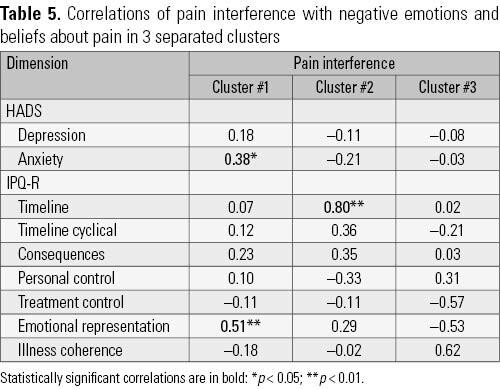 Table 5 presents the values of pain interference correlation coefficients with anxiety and depressive symptoms as well as with beliefs about pain, in the three separated clusters. 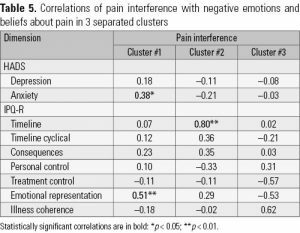 Pain interference positively correlated with anxiety (rho = 0.38; p < 0.05) and with the dimension of cognitive representation of negative emotions (rho = 0.51; p < 0.01) in subjects from Cluster #1. The correlation between pain intrusiveness and timeline (rho = 0.80; p < 0.01) proved to be significant in Cluster #2. In women with low anxiety and depressive symptoms, cognitive representation of negative emotions was associated with high pain interference. In contrast, high anxiety level was associated with an interfering role of pain, if the pain was linked to the beliefs of its chronic nature. In Cluster #3 no statistically significant correlations were found. Results obtained in this study point to significant relationships of anxiety and depressive symptoms with pain in women after mastectomy. In the research on chronic pain, understanding the role of psychosocial factors is now well recognized, as combining it with a biomedical perspective allows a more sophisticated perspective on the complex and multifactor nature of pain. An answer is therefore actively sought to the question of how emotions, beliefs, social support, socioeconomic status and behavior make it possible to identify factors involved in initiating, changing severity, and maintaining the presence of chronic pain symptoms. The presence of anxiety and depressive symptoms in breast cancer survivors has been noted in other authors’ studies1-3,8,11,22-24. It was also observed that the severer were depressive symptoms and anxiety, the more destructively pain interfered in the respondents’ daily functioning (intrusiveness). Pain interference was associated with higher anxiety levels: the more severe the anxiety, the higher the assessment of pain interference. Results from other studies indicate an analogous tendency12,13,25. We have also demonstrated that the coexistence of depressive symptoms and anxiety increased the assessment of chronic pain severity and interference. With reference to Leventhal’s model, the results of this study indicate that pain experienced by post-mastectomy women is significantly determined by an emotional component – a belief that the pain exists. These results are corroborative of the conception that experiencing symptoms generate a cognitive and an emotional representation of a disease or emergency. The parallel presence of both representations is particularly important as the symptoms has been proven to manifest in all three stages of coping with disease (health risk): from creation of an own representation of the disease, through behaviors related to coping, to the stage of evaluating the effectiveness of adapted behavior17. Other studies have shown that the assessment of experienced pain severity depends on the meaning attributed to pain26, on the existing cognitive schemata, and on expectations about symptoms associated with the disease27. According to the severity of depressive symptoms and anxiety, 3 clusters were separated. Among women with characteristic relatively low levels of anxiety and depressive symptoms (Cluster #1), it has been demonstrated that anxiety significantly correlates with perception of pain severity and with pain interference. Among women with characteristic relatively low depressive symptoms and high anxiety (Cluster #2), the assessment of pain as more severe and more intrusive was associated with a belief of its chronic nature. In patients with high anxiety and severe depressive symptoms (Cluster #3), the perception of lower pain severity referred to women who did not link the pain presence to cancer. The obtained results indicate a need for further research on illness coherence in the perception of chronic pain. The results of this study suggest that the perception of pain severity is related to the intensity of anxiety and depressive symptoms and to the beliefs about pain duration. In conclusion, the completion of cancer treatment didn’t eliminate neither the anxiety about a life threat nor the negative affect. Regardless of the biological determinants of chronic pain in post-mastectomy women28-31, the results of this study indicate a vital importance of psychological determinants in the severity and intrusiveness of pain associated with anxiety and depressive symptoms and with a system of beliefs relating to pain duration. Consistent with these results are studies showing correlations of anxiety and depressive symptoms with severity of pain32 and with quality of life, or particularly its physical dimension33, in post-mastectomy women. The obtained results are in agreement with the observation that intrusive thinking is related to negative psychological and somatic sequelae34. 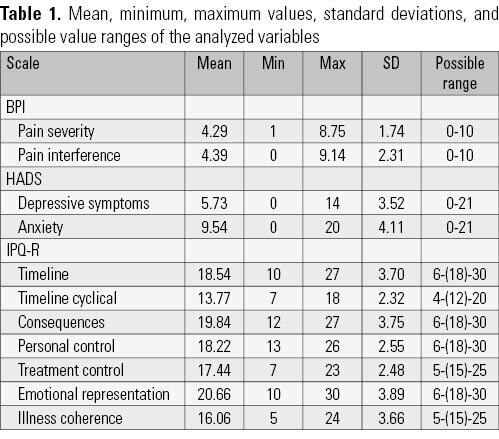 The connection between illness intrusiveness and exacerbation of depressive symptoms, regardless of age, physical disability, severity of the disease, current condition or contextual variables, is emphasized in many studies12,13,25 and appears important in psychoeducational approach to this group of patients. According to the findings of this study, the presence of chronic pain in post-mastectomy women is associated with anxiety and depressive symptoms. The connections between anxiety and depressive symptoms in the 3 subgroups of subjects were of varied intensity and were differently linked to pain severity, pain interference, and to the beliefs about pain. This study has also revealed significant relationships of anxiety and depressive symptoms with beliefs about pain persistence in the future and with beliefs about a destructive role of pain in everyday life. Chronic pain appeared more intrusive in women who associated it with an ineffective treatment (duration) and disease. In this group of patients, it should be vital to build the belief that breast cancer is a chronic disease, more and more often treated successfully. Convictions about the impossibility to cure cancer alleviate anxiety and depressive symptoms and become a cause of delaying the proper diagnostic tests, which perpetuates the vicious circle and the negative picture of the disease35. Results of this study refer to a relatively small group of women selected according to predetermined clinical criteria (in the course of physiotherapy, after radical mastectomy, the presence of chronic pain). The results make a preliminary report of a broader research on psychosocial contexts of chronic pain, comprising various clinical groups with different etiopathogeneses of pain. In post-mastectomy patients, pain severity was associated with anxiety and depressive symptoms severity and with beliefs about pain duration. Symptoms of anxiety and depression as well as the system of beliefs about pain duration were associated with pain interference (everyday functioning distortion). This work was supported by the Medical University of Gdańsk statutory funds under grant ST 275279. 1. Bulotiene G, Veseliunas J, Ostapenko V, Furmonavicius T. Women with breast cancer: relationships between social factors involving anxiety and depression. Arch Psychiatry Psychother. 2008;4:57-62. 2. Gandubert C, Carrière I, Escot C, Soulier M, Hermès A, Boulet P, et al. Onset and relapse of psychiatric disorders following early breast cancer: a case-control study. Psychooncology. 2009;18(10):1029-37. 3. Segrin C, Badger T, Dorros SM, Meek P, Lopez AM. Interdependent anxiety and psychological distress in women with breast cancer and their partners. Psychooncology. 2007;16(7):634-43. 4. Hovind IL, Bredal IS, Dihle A. Women’s experience of acute and chronic pain following breast cancer surgery. J Clin Nurs. 2013;22(7-8):1044-52. 5. Jensen MP, Chang HY, Lai YH, Syrjala KL, Fann JR, Gralow JR. Pain in long-term breast cancer survivors: frequency, severity, and impact. Pain Med. 2010;11(7):1099-106. 6. Katz J, Rosenbloom BN, Fashler S. Chronic Pain, Psychopathology, and DSM-5 Somatic Symptom Disorder. Can J Psychiatry. 2015;60(4):160-7. 7. Disorbio JM, Bruns D. A multidimensional approach to pain assessment using BHI™ 2. Health Psychol Rehabil. 2004;4. 8. Adams N. Psychological, electromyographic, and neurochemial aspects of chronic low back pain: can a biopsychosocial model be confirmed? J Musculoskelatal Pain. 2006;14:33-44. 9. Dupont A, Bower JE, Stanton AL, Ganz PA. Cancer-related intrusive thoughts predict behavioral symptoms following breast cancer treatment. Health Psychol. 2014;33(2):155-63. 10. Mehnert A, Berg P, Henrich G, Herschbach P. Fear of cancer progression and cancer-related intrusive cognitions in breast cancer survivors. Psychooncology. 2009;18(12):1273-80. 11. Bishop SR, Warr D. Coping, catastrophizing and chronic pain in breast cancer. J Behav Med. 2003;26(3):265-81. 12. Mah K, Bezjak A, Loblaw DA, Gotowiec A, Devins GM. Measurement invariance of the Illness Intrusiveness Ratings Scale’s three-factor structure in men and women with cancer. Rehabil Psychol. 2011;56(1):58-66. 13. Devins GM, Bezjak A, Mah K, Loblaw DA, Gotowiec AP. Context moderates illness-induced lifestyle disruptions across life domains: a test of the illness intrusiveness theoretical framework in six common cancers. Psychooncology. 2006;15(3):221-33. 14. Smith WC, Bourne D, Squair J, Phillips DO, Chambers WA. A retrospective cohort study of post mastectomy pain syndrome. Pain. 1999;83(1):91-5. 15. Leventhal H, Meyer D, Nerenz D. The common sense representation of illness danger. Contrib to Med Psychol. 1980;2:7-30. 16. Moss-Morris R, Weinman J, Petrie K. The revised illness perception questionnaire (IPQ-R). Psychol Health. 2002;17:1-16. 17. Broadbent E, Petrie KJ, Main J, Weinman J. The brief illness perception questionnaire. J Psychosom Res 2006;60:631-7. 18. Zigmond AS, Snaith RP. The hospital anxiety and depression scale. Acta Acta Psychiatr Scand. 1983;67(6):361-70. 19. de Walden-Gałuszko K, Majkowicz M. Ocena jakości opieki paliatywnej w teorii i praktyce. Gdańsk: Akademia Medyczna w Gdańsku, Zakład Medycyny Paliatywnej; 2000. 20. Cleeland CS, Ryan KM. Pain assessment: global use of the Brief Pain Inventory. Ann Acad Med Singapore. 1994;23(2):129-38. 21. Leppert W, Majkowicz M. Polish brief pain inventory for pain assessment and monitoring of pain treatment in patients with cancer. J Palliat Med. 2010;13:663-8. 22. Schou I, Ekeberg Ø, Ruland CM, Sandvik L, Kåresen R. Pessimism as a predictor of emotional morbidity one year following breast cancer surgery. Psychooncology. 2004;13(5):309-20. 23. Kratz AL, Davis MC, Zautra AJ. Attachment predicts daily catastrophizing and social coping in women with pain. A Health Psychol. 2012;31(3):278-85. 24. Crombez G, Eccleston C, Van Damme S, Vlaeyen JW, Karoly P. Fear-avoidance model of chronic pain: the next generation. Clin J Pain. 2012;28(6):475-83. 25. Devins GM, Edworthy SM, Paul LC, Mandin H, Seland TP, Klein GM. Illness intrusiveness and depressive symptoms over the adult years: is there a differential impact across chronic conditions? Can J Behav Sci. 1993;25:400-13. 26. Crook P, Rose M, Salmon P, Stott R, Peters S, Stanley I. Adherence to group exercise: physiotherapist-led experimental programmes. Physiotherapy. 1998;84(8):366-72. 27. Salmon P. Psychologia w medycynie: wspomaga współpracę z pacjentem i proces leczenia. Gdańsk: Gdańskie Wydawnictwo Psychologiczne; 2002. 28. Macdonald L, Bruce J, Scott NW, Smith WC, Chambers WA. Long-term follow-up of breast cancer survivors with post-mastectomy pain syndrome. Br J Cancer. 2005;92(2):225-30. 29. Spyropoulou AC, Papageorgiou C, Markopoulos C, Christodoulou GN, Soldatos KR. Depressive symptomatology correlates with phantom breast syndrome in mastectomized women. Eur Arch Psychiatry Clin Neurosci. 2008;258(3):165-70. 30. Ozalp G, Sarioglu R, Tuncel G, Aslan K, Kadiogullari N. Preoperative emotional states in patients with breast cancer and postoperative pain. Acta Anaesthesiol Scand. 2003;47(1):26-9. 31. De Oliveira GS Jr, Chang R, Khan SA, Hansen NM, Khan JH, McCarthy RJ, et al. Factors associated with the development of chronic pain after surgery for breast cancer: a prospective cohort from a tertiary center in the United States. Breast J. 2014;20(1):9-14. 32. Schou Bredal I, Smeby NA, Ottesen S, Warncke T, Schlichting E. Chronic pain in breast cancer survivors: comparison of psychosocial, surgical, and medical characteristics between survivors with and without pain. J Pain Symptom Manage. 2014;48(5):852-62. 33. Repka I, Wordliczek J. Emotional state versus quality of life of patients with chronic neuropathic pain. Postępy Nauk Med. 2013;26:730-6. 34. Friedman LC, Kalidas M, Elledge R, Chang J, Romero C, Husain I, et al. Optimism, social support and psychosocial functioning among women with breast cancer. Psychooncology. 2006;15(7):595-603. 35. Chojnacka-Szawłowska G, Kościelak R, Karasiewicz K, Majkowicz M, Kozaka J. Delays in seeking cancer diagnosis in relation to beliefs about the curability of cancer in patients with different disease locations. Psychol Health. 2013;28(2):154-70.